The Tineke rose is a white blossom with a slight pinch of green. When fully bloomed the head of this floret is a giant star shape. As far as white budss come this is the very Best White Rose due to its uniqueness and head shape. For that perfect white wedding a pure white blossom may not be best because it may give onlookers the impression of inauthenticity. With them guests will know right away that they are looking at the genuine article and be inspired by the purity and love of you and that special someone. All of our products are of the finest quality. We use only the most advanced and modern methodologies at our state of the art greenhouses in order to provide you with the very finest blossoms nature's bounty has to offer. Colombia is home to all of our facilities and we are proud to be located there because we are able to drench all of our products with yearlong sunshine. Our florets grow constantly, this allows USA to get you what you need whenever you decide to order. 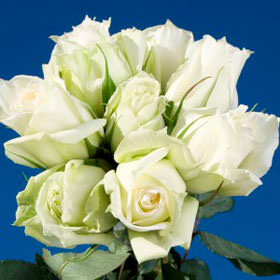 Make your next Best White Rose orders with USA soon. All customers in the USA mainland will receive free shipping thanks to FedEx. Freshness is guaranteed upon arrival and your buds will need up to seventy-two hours for your bundle to fully bloom.